The entrée system provides a powerful rule based commission system to ensure your salespeople and brokers are paid their proper commission at the proper time. Standard commissions are defined in the commission grid by creating table based rules on the total dollar amount of each invoice and the percentage of gross profit made on that sale. This is accomplished by first defining invoice and gross profit breakpoints. 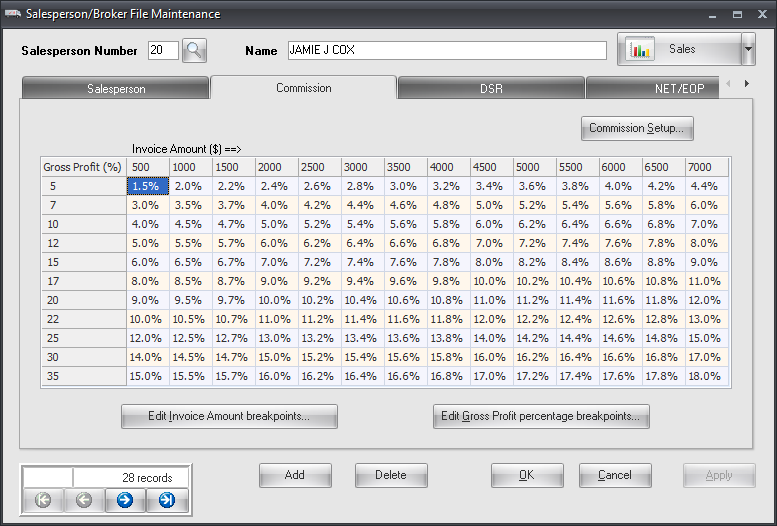 Finally, commission percentages are entered into the grid of the commission table. Commissions can then be calculated by entrée based off the gross profit dollars or sale amount of the invoice. Rules also include the option of not paying a commission until the invoice has been paid by the customer, as well as decreasing the commission amount the longer it takes the customer to pay. These types of rules encourage your salespeople and brokers to earn the higest commission when the distributors gross profit goals are met and the customer pays in a timely manner. Detailed commission reports are provided including a breakdown of each item on a customer's invoice and the commission earned. Each salesperson and broker in entrée can be configured to be paid commissions based on the gross profit of the invoice or the total sale amount. Tracking quotas and bonuses based on weekly, monthly and yearly goals is provided. The entrée system can also adjust the commission earned based upon the customer taking excessive time to pay for the invoice. This feature provides motivation to help collect the moneys owed as soon as possible so that the salesperson or broker can collect a higher commission. The goal of every food distributor is to compensate your sales force fairly for their efforts. However, because of the wide variety of items offered and the special purchase arrangements behind many of them, tracking them all can be a difficult task. As the name implies, the purpose of Item Commission Exceptions is to maintain the "exceptions to the rule" when paying commissions. 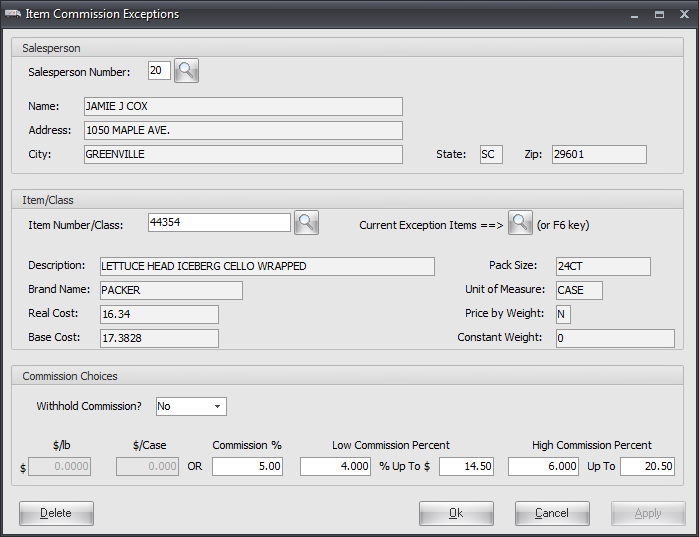 Commission exceptions, can be based on individual items or an entire class of items. When entrée calculates the commission to be paid, it will first check to see if there is a commission exception defined and handle it accordingly. 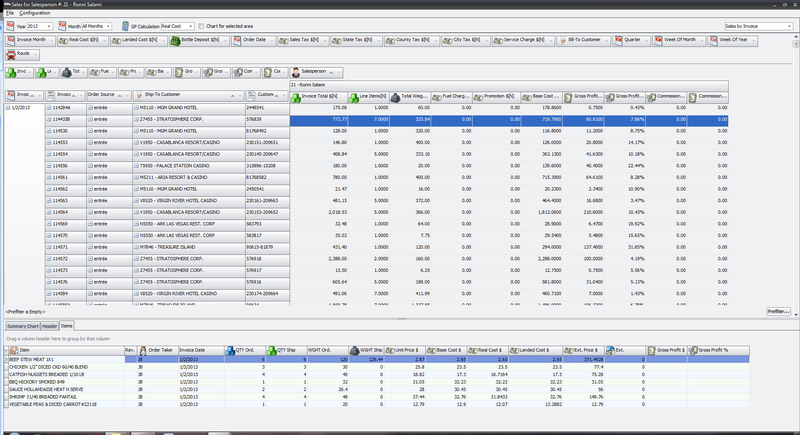 A powerful commission system requires comprehensive commission reporting, and this is exactly what entrée provides. Your salespeople can see their earned commission as they create a customer order, such as with our Electronic Order Pad app for the iPad. 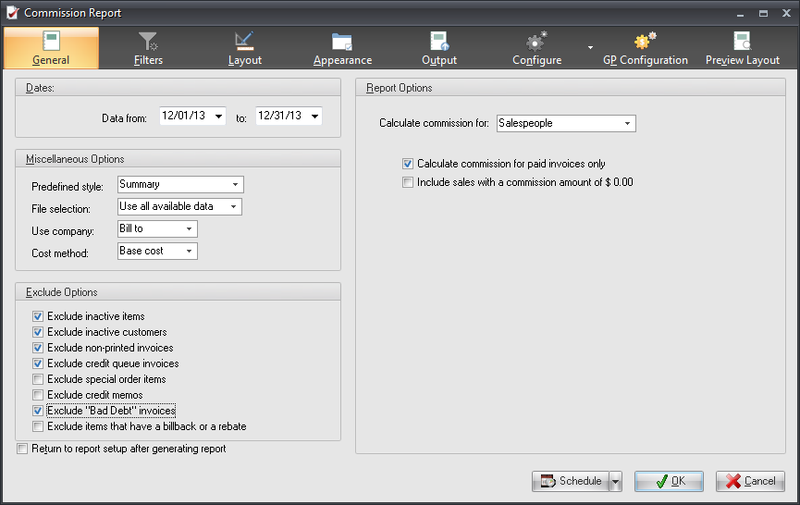 Later, when you are ready to calculate commissions for a specific time period, entrée can generate reports to show exactly how the the commission was calculated. Summary commission reports as well as more detailed reports showing the breakdown of the commission earned on each item on a customer's invoice are available. An important part of entrée is its use of dashboards, especially when it comes to analyzing salesperson sales and commissions to summarize large amounts of complex information and represent it in a cross tabulated form, with drill-down options. They are completely user customizable so you can reorganize the layout and sorting using drag-and-drop and you can visualize your data by summarizing into different charting styles including: pie charts, line charts, bar charts and area charts. Salesperson dashboards are available for analyzing commissions, sales by item, sales by brand, sales by class, top performing salespeople and yearly comparisons.